Tailor Devotional Routines to Meet Your Family’s Needs. Many parents wonder what they should do during family devotional times. There are no simple answers, since endless options allow each family to customize their time together. Consider the ages of your children, how much time you have together, when you can meet, and the areas in which your family needs to grow. With these factors in mind, come up with a plan that meets the current needs of your family. Periodically consider making adjustments to accommodate your schedule or needs. Below you’ll find ideas you can incorporate into your family worship times. Be sure to pray with your spouse as you decide what to do. Seek to be creative and to discern God’s direction for this season in your family’s life. The Catechism provides essentially, a summary of the official teachings of Catholic beliefs including creeds, sacraments, commandments, and prayer. It is a very needed tool in keeping our faith in line with catholic teaching. The Gospels provide eye-witness accounts of the life of Jesus Christ. The New Testament epistles discuss God’s work of redemption and give instructions for walking worthy of God’s calling on our lives. The law, histories, and prophecies of the Old Testament offer valuable lessons that we can apply today. The Books of Psalms and Proverbs (which can be read on a monthly schedule) will help you deepen your prayer life and gain wisdom. Work on making this time interactive for each member of the family. Take turns reading aloud, encouraging the children to participate. Address any questions that arise, and allow time for discussion. (Small children may color or play quietly during family devotions.) Your appreciation for God’s Written Word will deepen as you discover insights that apply to situations you are currently facing. 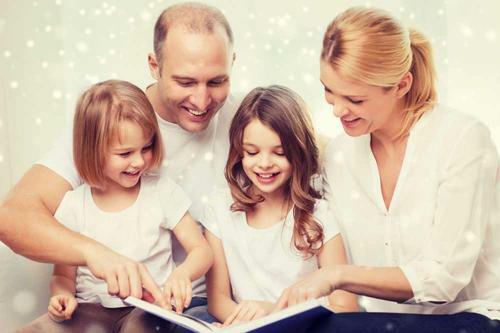 Read-aloud options are as varied as the special interests of your family! If there is a main area in which you all would like to mature, such as prayer or evangelism, consider reading a book on the topic. Christian classics and biographies are also excellent selections that families can enjoy together. If you have older children, ask them for book suggestions. If you have younger children, look for Bible story and devotional books that may be helpful in your family worship times. Parents with young children have enjoyed using this technique, because it builds a fun, trusting bond with the father. Dads can set a time when they become the “answer man.” During that time the children ask any questions they have, and the father will do his best to answer them. If he doesn’t know the answer, he’ll find the answer. Be creative in how you plan for this time. You might incorporate it into family devotions, or you could designate a separate time for it, such as after dinner or just before the children lie down for the night. Have the children take turns asking questions so that each child has a chance to get in on the discussion. This is a great way to encourage curiosity and to find out what your little ones are thinking about. If a question requires extra time for research, let your children know that you’ll work on it and share the answer later on. Follow through on these questions and enjoy the time with your children. One of the special things you can do together is to sing songs of praise and worship. Sing hymns, psalms, and spiritual songs. Many families enjoy learning to harmonize with one another. If any of your family members play musical instruments, encourage them to learn to accompany you as you worship together. Think about the current needs of your family. Do you want to learn about a particular issue? What problems are you facing in this season of life? Are you struggling with conflicts in the family, church, workplace, or community? Your devotional time may provide the perfect opportunity for doing a topical study that will address these needs. You can incorporate Scripture passages, research, books, and activities to design a study that will increase your family’s understanding in specific areas. When you gather for devotions, be sure to pray together. Praying the rosary together every night or morning as a family. Ask for prayer intentions each one has, are there intentions for friends friends, church, or your community? Pray about national and international concerns. Pray for the Church around the world, remembering the work of missionaries and the needs of the persecuted Church. Be alert to needs you can pray about, and keep a journal of your prayer requests and praise reports (answers to specific prayer requests). Make the most of each feast days spiritual and historical significance as your family develops and enjoys meaningful, Christ-centered and Catholic centered traditions. During family vacations, blend your recreational activities with time for spiritual discussion and reflection. Spend time in worship around the campfire or at a midway point on a hike. While traveling in the car, talk over Catholic and Biblical topics or sing together. After tours or special activities, share what you learned and discuss how it helps you see God and His work from a fresh perspective. Pray about any needs that arise and for the people you meet along the way. Watch to see how God answers your prayers and blesses your trip, and then record the results in your prayer journal. Parents are familiar with the adage that “more is caught than taught,” because they experience its truth each day. Your children will closely observe your attitudes toward family devotions, and by your actions, they will know whether or not these times are a priority in your life. God entrusts parents with the primary responsibility for training their children in His ways—what more sacred and exciting calling can you imagine? You are able to lay the foundations for future generations and to share with your children the most precious realities of God and His love for His children.